Why Should I Hire A Marketing Agency For My Small Business? Hiring a marketing firm to achieve the results you want for your business could be the best decision you make. Look at the comparison to hiring an internal marketing staff. If you have a business, you need customers...plain and simple. Without customers, there really is not much reason to get up in the morning, drive to the office, turn on the lights, make payroll and all the myriad of tasks that we do as business owners. We have updated this post with a great infographic called Hiring A Marketing Agency vs Hiring Internal Staff. Click here to view the infographic. We are often asked by business owners, " what should my marketing budget be." If I am going to hire a marketing agency or hire internal staff what are the financial costs associated with both options? We cover this very question in the next section. 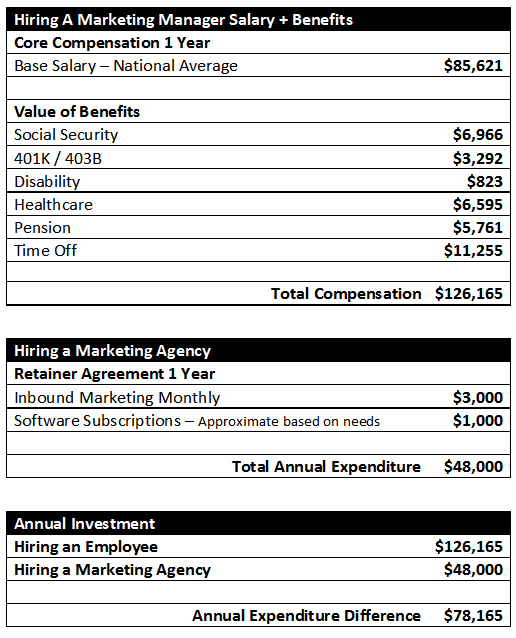 How much do you think it would cost to hire a qualified marketing employee vs. hiring a marketing agency? Most business owners don’t have a true basis for comparison and typically use a rudimentary methodology for decision making. In many cases, business owners might use a base salary versus an hourly quote for a marketing agency and thus conclude that since the hourly rate is higher it therefore must be the more expensive option. This is a big mistake. Many owners fail to take into account the true costs associated with hiring and retaining an employee. As the chart below shows, not only do you have to account for base salary, but adding in fixed expenses such federal, state and/or local taxes as well as health insurance contributions, retirement plan matches, vacation, sick days, etc., and the true cost can be as much as 1.25 to 1.4 times the base salary. Add in additional expenses such the cost of recruiting and training and the total starts to escalate quickly. Let's take a closer look and see what really happens when you compare the two. Disclosures: We used the job position of Marketing Manager for the comparison. Many marketing professionals specialize in one area of marketing, like a social media marketing manager, and may not have the experience that a marketing manager could have. All the salary data is based on the National Average salary for a Marketing Manager in the USA, and was taken from Salary.com. There are also many elements to marketing, so we chose the inbound marketing process which emcompasses many of the items listed above. While the numbers are averages and should be adjusted based on your needs, location of business, etc. 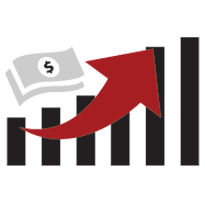 The table should give you a better understanding of the approximate costs of hiring each one. Click on the infographic to see an enlarged version. In addition to sunk costs in hiring the right employee, the effective execution of many marketing tasks requires extensive software applications which require DINERO (that’s money)……..lots of it in the form of upfront purchases and annual subscriptions of graphics programs, ppc management apps, business metrics software and a whole host of other requirements. In addition to the pure cost factor of hiring an employee, there is one additional factor that needs to be considered. It would be exceptionally difficult to find one person that possesses each of the skills required to execute your strategy. This would most likely require your new marketing hire to outsource at least some of these tasks to outside agencies, which really blows this comparison out of the water. As you can see after taking these factors into consideration, hiring marketing staff is no bargain. The big question then isn't can I afford an experienced marketing agency, but rather how much am I costing myself in time, money and lost opportunity by trying to do these marketing services in-house.